GAB is pleased to publish this account and analysis of the 6th day of the trial of Equatorial Guinean Vice President Teodorin Nguema Obiang by Shirley Pouget and Ken Hurwitz of the Open Society Justice. On day six of his trial for actions arising from theft of public monies, Teodorin’s lawyers offered several legal defenses. The most bizarre, and the one most strenuously advanced, was that in Equatorial Guinea theft of public funds is not a crime if the thief is a senior government official. Teodorin was a government minister at the time he stole the money, and according to his lawyers, there was no law in Equatorial Guinea that made it a crime for a minister to steal public funds. The defense also tried to lob a procedural bombshell into the proceedings. It claimed that the way French courts have interpretred bribery as a predicate offense for money laundering is unconstitutional. This constitutional objection, a Question Prioritaire de Constitutionalite, could have been lodged early in the proceeding. Raising it so late in the case, would, if the court accepted the defense request, postpone the trial proceedings for many months. These legal arguments were offered after Teodorin’s lawyers had earlier failed (here and here) to offer any real evidence to rebut facts showing their client had robbed the people of Equatorial Guinea in pursuit of a lavish lifestyle. Besides the “ministers are free to steal at will” claim and the constitutional objection, the defense contended that as a matter of law i) as an official of Equatorial Guinea Teodorin could not be tried by a French court, and ii) it is not a crime under French (as well as EG) law to steal money from the citizens of Equatorial Guinea. Defense counsel conceded that these latter two arguments have been soundly rejected by French courts. The only way it could prevail on them was to ask the tribunal for permission to stay the trial proceedings to allow it to seek a ruling from France’s Constitutional Court that these earlier decisions were contrary to the French Constitution. To be convicted of money laundering, the money that is laundered must, therefore, be the proceeds of a crime, or what the law terms a “predicate” offense. But a crime where? In France? Equatorial Guinea? In both? Defense counsel argued that the predicate offense had to be a crime in both France and Equatorial Guinea. For Teodorin to be guilty of money laundering, his lawyers asserted, the Teodorin’s receipt of the funds must be crimes under French law. Otherwise the case must be dismissed. The tribunal then ruled that, even if it did not have the legal authority to try the predicate offenses, it was still competent to define the acts taking place outside French jurisdiction as the equivalent of crimes under French law (“qualification juridique”). The tribunal also noted that it will, in addition, have to be satisfied that the wrongful conduct were also criminal offenses under Equatoguinean law. On the claim that theft of public monies in Equatorial Guinea is not a crime under Equatoguinean law, the presiding judge began by observing that Equatorial Guinea is party to relevant treaties, including the Treaty of the Organization for the Harmonization of Business Law (OHADA), as well as the Treaty establishing the Central African Economic and Monetary Community (CEMAC). See for example Article 891 of the OHADA’s Uniform Act on Commercial Companies and the Economic Interest Group which prohibits misuse by business managers of business property or funds for personal gain. Article 9 of OHADA’s Uniform Act on General Commercial Law specifically prohibits ministers from engaging in business activities and private enrichment. Moreover the tribunal observed that, when he was a minister, Teodorin had said he engaged in commercial activities in contravention of both regional and domestic law. The presiding Judge cited an affidavit Teodorin had filed in the High Court of South Africa where he had acknowledged that it is normal for “a cabinet minister [to end] up with a sizeable part of the contract price in his bank account” (para. 11.2). The tribunal indicated that the criminality of the predicate offenses had been amply established. The wrongful misappropriation of public funds, abuse of confidence (abus de confiance) and corruption ( i.e., bribery) – the predicate offenses for a money laundering charge in France — are all crimes under EG law. The defense replied that articles 394 (stealing public funds), 396 (diverting public funds) and 401 (conflict of interest) of the Equatoguinean Penal Code are contained in the section on offenses committed by civil servants (“funcionarios”). As a matter of law, they argued, it cannot be asserted that Teodorin (formerly a minister, now vice president) was a civil servant because Equatoguinean Law 2/2005, Functionarios Civiles del Estado article 2), classifies ministers and other senior officials as “ member[s] of government,” not as civil servants. Equatoguinean law on civil servants could, to be sure, be more clearly drafted. But the claim that it excludes from its reach senior government officials seems incredible on its face as well as belied by the several provisions of Equatoguinean law cited by the tribunal and the civil parties. Moreover, to say that a low level government employee could be severely punished for stealing small amounts of money, but a minister could steal the nation’s income with impunity makes no sense. No government could function if that were the law. The tribunal discussed the judgment of the Bioko Norte Provincial Criminal Court of Equatorial Guinea. As discussed in the day two post, that court found that the representatives of the three companies named in the French indictment had carried out activities associated with the predicate offense legally in Equatorial Guinea and had thus acquitted the defendants. The presiding judge, noted, however, that: “The reading of the judgment [in the Bioko Norte case] indicates that the Prosecution brought criminal charges following the judicial investigation that took place in France. The judgment refers to the investigation file of the French Investigative Magistrates,” raising the suspicion that a confidential document had been illegally leaked by someone connected with the defense. The tribunal asked the defense how the Republic of Equatorial Guinea — which is not a civil party to the French case —was given access to an investigation file covered by professional privilege. The defense replied that the ‘dossier’ was included into the file of the ‘Commission Rogatoire’ (i.e., an international legal assistance request) which was communicated to the government of Equatorial Guinea. The presiding judge responded that the judgment refers to the investigating magistrate’s decision to render the accused to trial, a document issued subsequent to the ‘Commission Rogatoire.’ The defense indicated that the French Minister of Foreign Affairs would have communicated the ‘Instruction [investigation] file’ to the EG government. So far as the civil parties were concerned, however, only the defense lawyers had been or should have been made aware of that file. “I have been working at the Ministry of Foreign Affairs for many years. It is impossible that the French Embassy could have sent the file under diplomatic note,” said the counsel for the civil party CORED. The French Prosecutor pointed out that the decision was rendered on behalf of the President of Equatorial Guinea. In France judicial decisions are rendered on behalf of the French people. As part of what seemed to be the defense’s stalling tactics, to get the proceedings suspended, they raised a constitutional objection — a Question Prioritaire de Constitutionalite (“QPC”) six days after the trial first started – and almost seven years after the formal investigation had commenced..
For the benefit of readers not conversant in French criminal proceedings, the QPC is a mechanism through which a party can challenge the constitutionality of a legal provision or the constant and settled interpretation given to that provision by French Courts. The QPC may be raised at any time during the proceedings. Three conditions are set out in in Law 2009/1523 of 10 December 2009 for the QPC to be admissible: a) the provision must be relevant to the dispute or constitute the basis on which prosecution has been initiated, b) the constitutionality of the contested provision must not have been previously established and c) the QPC must be serious and not be part of a delaying tactic. The QPC can be raised before any court, which has sole discretion to refer it to either of the two Supreme Courts (the Cour de Cassation or the Conseil d’Etat). If the QPC is deemed admissible, the Supreme Courts have three months to decide whether or not to refer the question to the Constitutional Court. In effect, the QPC may suspend the proceedings for six months or more. To build their case, the defense challenged the pre-2000 judicial interpretations of article 432-11 of the Penal Code (corruption of public officials). The defense complained that these interpretations improperly permitted prosecution of foreign bribery and use of foreign bribery as a predicate for money laundering despite the fact that at the time bribery of foreign officials had not been criminalized in France. For the defense, the Cour de Cassation was wrong to convict a foreign defendant of money laundering committed at a time when the offence of corruption of foreign public officials — predicate offense of the crime — was not wrongful conduct prohibited in French law. The position of French courts should therefore be declared unconstitutional as it contravened the principle of legality — according to which there can be no crime without a pre-existing penal law. Moreover, Teodorin’s Counsel also noted, in its reasoning the Court of Appeal failed to consider the fact that the defendant was a minister of government. “To reach its decision, the Court of Appeal heard the case as if the defendant were a national public official of France and the corrupt conduct had been committed in France. But the Court of Appeal would not have had jurisdiction over this case if he had in fact been a French public official, since French officials are tried before the Haute Cour de Justice (High Court of Justice).” The defense argued that the QPC was admissible insofar as it met the three conditions set out above. The civil parties made three main arguments to challenge the admissibility of the QPC. 1) The defense failed to raise a QPC which effectively challenged the constitutionality of the jurisprudential interpretation given to the scope of a legal provision. The question contested the conditions of applicability of the law in an ongoing proceeding. In three decisions (Cass. Crim, 16 September 2015; Cass. 1er civ. 8 December 2011 and Cass 1re civ., 27 Sept. 2011) the Cour de Cassation made it clear that a QPC that challenges the conditions of application of the law — and not the conformity of either a legal provision or a jurisprudential interpretation as to its scope with the rights and freedoms guaranteed by the Constitution — is deemed inadmissible. 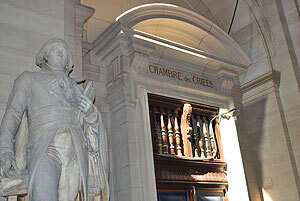 The 24 February 2010 decision of the Cour de Cassation confirmed that French courts were competent to ascertain the existence of predicate offenses regardless of the place of their commission. The ruling in effect goes against the accused, hence the (improperly conceived) QPC. 2) The civil parties recalled that Teodorin was on trial for money laundering, abuse of corporate assets, misappropriation of public funds, abuse of confidence and corruption. Misappropriation of public funds is therefore not the only predicate offense of the crime of money laundering, an “autonomous” offense in French law. Nothing, therefore, bars the tribunal from ascertaining whether the wrongful predicate acts fell within the meaning of French law. The civil party concluded, and the floor was given to the prosecution. The prosecutor welcomed discussions on points of law. Although the defense’s claim in its QPC has never been raised before the Constitutional Court, there is no difficulty with respect to the applicability of French law to the legal characterization of a predicate offense committed abroad. The case law is constant and settled; French courts have jurisdiction to establish the illicit origin of funds, and for this reason the constitutional objection should be dismissed. And yet, this is the de facto (if not de juris) reality in many countries worldwide. All too often, “anti-corruption reforms” end up targeting petty bribery while leaving high-level corruption intact.